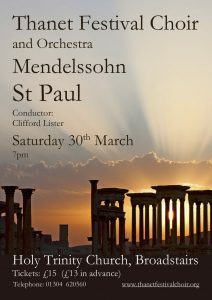 Following on from our memorable performance of Elijah in 2014, we are delighted to present Saint Paul, the first of Mendelssohn’s oratorios, written when the composer was in his twenty-sixth year. The subject offered tremendous dramatic possiblities to the young composer, who rose to the challenge magnificently. 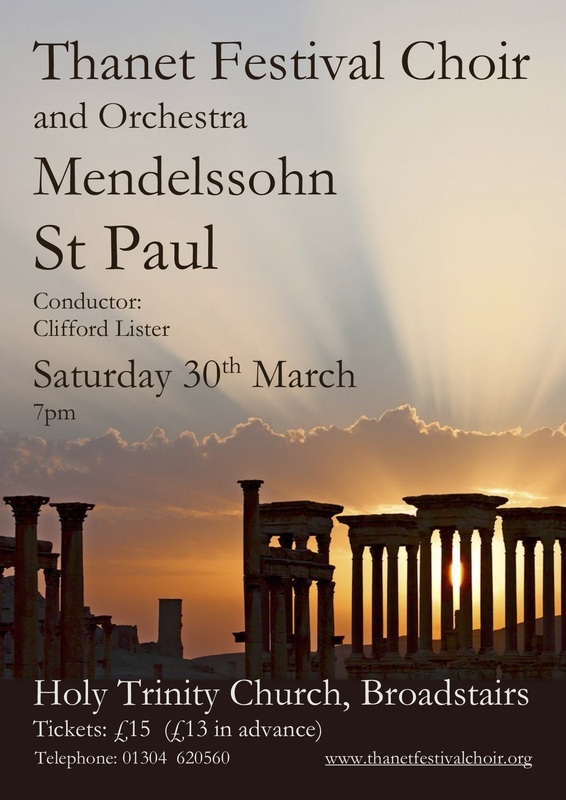 Mendelssohn held the choral masterpieces of Handel, Bach and Haydn in high regard, and Saint Paul is modelled on similar lines, with an integrated scheme of recitatives, arias and thrilling choruses telling the story of the Apostle. The text is based largely on The Acts of the Apostles, and there are three principal themes – the martyrdom of Saint Stephen, the conversion of Saint Paul, and the apostle’s subsequent career. During Mendelssohn’s lifetime, Saint Paul was a popular and frequently performed work, but it is now infrequently performed in its entirety. Indeed, as far as we know it has not previously been performed in the Isle of Thanet. This is a great pity as Saint Paul is a compelling piece, full of musical invention and innovation. Don’t miss this rare opportunity to hear it! Our Soloists are Helen Bailey (Mezzo-Soprano), Mark Dobell (Tenor) and William Gaunt (Bass), with Alicia Hunt (Contralto). We will be accompanied by the Thanet Festival Orchestra and the performance will, as usual, be conducted by Clifford Lister. Advance tickets for this concert are now on sale, £13 for adults (£15 at the door) and £2 for children. Available from Choir members, from the Ticket Secretary telephone 01304 620560, or online below. There is an administration fee of £1 per booking for online purchases, to cover PayPal and postage costs. All seating is unreserved. Please note that the start time for this concert is 7pm, and allow plenty of time for parking. Parking in the Vere Road car park (CT10 1JF), which is within easy walking distance of the Church, is free on Saturdays. Parking is also available in the Albion Street car park (CT10 1NE) opposite the Church, and in nearby streets such as Crow Hill, Rectory Road and Eastern Esplanade. The cut-off date and time for online ticket sales is 1am on Saturday 30th March. If you have any problems booking online please contact us. Tickes for this event are not yet available.